Relatives of Myrick says they will not stop until they find him. San Jose police have arrested a man's co-worker after he went missing Friday, four days after he started a job at a motorbike shop. The missing man is now believed to be dead, though his body is nowhere to be found. Officers arrested Steve Hlebo, a 39-year-old Los Altos resident, on suspicion of murdering 28-year-old Kyle Myrick and booked him into Santa Clara County Jail on Saturday. Both worked at GP Sports motorcycle shop in the Cambrian neighborhood, Myrick's last known location. The family of Myrick told NBC Bay Area that the two didn't know each other beside Myrick's brief time at his new work location, where he had been transferred that week. About 90 relatives and friends of Myrick have been searching for him Sunday near the Lexington reservoir and around the Peninsula. Marianne Favro reports. Police have remained tight-lipped about the investigation, not revealing a motive or detailing evidence discovered in the case. A woman whom the family said was Hlebo's attorney declined to confirm she had been hired or not. Sources told NBC Bay Area that Myrick was killed inside a boarded up building in San Jose, next to where he and Hlebo worked at GP sports near Camden Avenue. Sources said there is a shared employee bathroom in that building. Someone told police that they thought Myrick left the store with Hlebo to grab some lunch, but neither returned to the store, according to the sources. After receiving a report that Myrick was missing Friday, officers searched the building and quickly concluded that it was the scene of a homicide. Officers identified Hlebo as a suspect, police said publicly, without saying why. Despite the murder arrest, Myrick's body has not been found. About 90 relatives and friends first began searching for Myrick's body on Sunday near the Lexington reservoir and around the Peninsula. The search went on well into the evening Sunday and resumed early Monday morning. The family said they would not stop searching until they find him. John Sparry, Myrick’s stepfather, has been organizing the search efforts. “There seem to be two areas where it could be very likely [that we find him],” Sparry said. 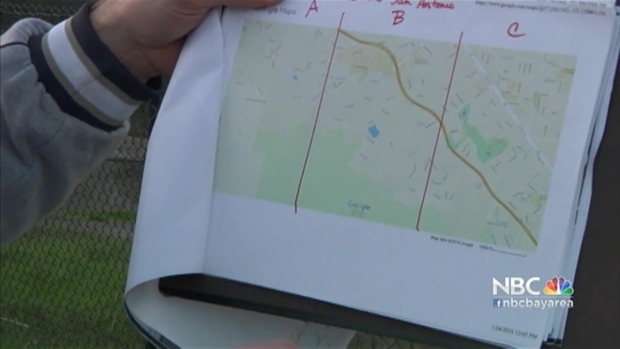 Search crews are specifically looking at offshoots and dirt roads near Loma Prieta Road. Along with canvassing the neighborhood and interviewing people, officers seized Hlebo's white 2003 GMC Sierra 1500 truck because they believe it's associated with the homicide. They are, however, are asking for help determining where the GMC was between 5 p.m. Friday and 2 a.m. Saturday. Meanwhile, some of Myrick's friends took to social media to seek prayers as well as help finding the man who was last seen near Union and Camden avenues in San Jose where he worked. Anyone with information about the case is asked to call Detective Sgt. Paul Hamblin or Detective Jason Tanner of the Homicide Unit at (408) 277-5283. Callers wishing to remain anonymous can call Crime Stoppers at (408) 947-7867. Anyone providing information that leads to an arrest and conviction of a suspect may receive a cash award from Silicon Valley Crime Stoppers. Anyone who wishes to help with the search can contact Kyle Myrick's stepfather, Johny Sparry, through his Facebook or email.